Everly Danu had met a hero. A real life hero who had saved her life from a gunman. And he kept getting better. They dated, and everything was amazing. He was funny, entertaining, and had great friends. His friends were becoming her friends. They were perfect together. She couldn't imagine how anything could go wrong. Landry Cooper hadn't expected much when he headed out to the bank. Instead, he found his life change in just a few moments. One minute, he was meeting an intriguing woman, and they set a date. The next, he was stopping a bank robbery. Not that stopping criminals was all that unusual. After all, he was a member of SWAT, and his enhanced abilities due to being a werewolf came in very handy at such circumstances. Unfortunately, he, and his other fellow werewolf SWAT members, had to always watch out for the cameras and be able to explain the almost unexplainable. As could be expected, Cooper had time on his hands after the bank incident, and he took full advantage by spending it with Everly. He had been helping on a bombing case, and an old friend who seemed to be having personal issues was in town. Through it all, Everly was a steady beacon, possibly the One for him. To Love a Wolf was a surprisingly intense romantic read with non-stop action, humor, and suspense. 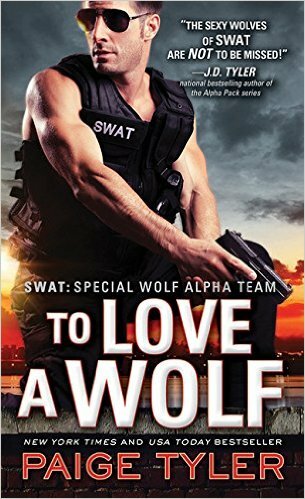 As the fourth story in Paige Tyler's SWAT: Special Wolf Alpha Team series, readers have come to expect a fun exciting read, but I think this is the best yet. When the conflict comes, whoa. The emotion grips the reader, and Landry is an unforgettable hero. Always willing to do anything for Everly. At the same time, I laughed aloud, especially regarding a certain minivan. The SWAT series just gets better and better, and I can't wait for the next one!